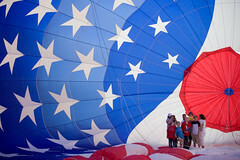 One of our family traditions has always been to go to the Freedom Festival balloon launch. We go all 3 days, getting up at 5:30am to be there by 6am to watch them inflate and launch. Yeah I know, nuts. But give it a try once… you’ll be hooked :). Over the years I have been in love with one specific balloon (above). What I always called “the flag balloon” but then found out it is actually the Dee III. There are two reasons I love this balloon. One, it’s just gorgeous. Two, the pilot (is that what balloonists are called?) Tim Taylor. Now Tim may be a gorgeous man in his own right (I have no opinion on that), but that isn’t the reason I like the man. For all these years that I have chased his balloon around to get pics I have always been amazed at how he treats the public. 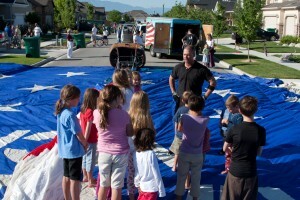 When he is preparing his balloon for launch, he always grabs a group of kids and walks them under the balloon. They are probably thinking how cool it is that they get to walk under a balloon, but then the unthinkable happens. He stops in the middle and opens one of the air vents and all the kids are now standing in the middle of a 105,000 cubic foot balloon envelope. Looking around with jaws open, and parents frantically taking pictures from the bottom opening. Pure awesomeness. 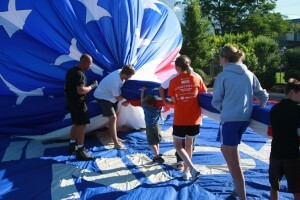 When most balloons land, the crew keeps people as far away as possible. When Tim lands, he gets them as close as possible. He invites everyone in to help him put his balloon away. Now this isn’t just the responsible adults that he invites, but every kid in the area… such as my rambunctious 3 year old Dallin. 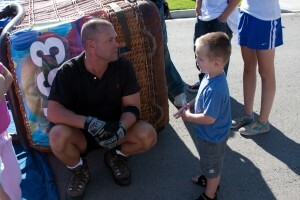 He trusts his balloon (worth 10’s of thousands) to the hands of kids… and loves doing it. Through a series of events last year I got to know Tim and his wonderful wife Daren. He told me how he loves to see the faces of the kids when they get asked to come closer, instead of being pushed away. Then to find out that they not only get to look, but to touch. He knows that he is creating memories that will last lifetimes for these kids (and their parents). I speak from experience where as a result of our chats, he has taken Dallin under his wing whenever he sees him. Dallin thinks he is the coolest guy in the word (well 2nd after me of course ;)). Tim always takes the time to say hi to him and listen to whatever cute ramblings he is spouting at that moment. Not the normal adult “yeah get it over with” but with genuine interest. This year when I went out to chase Tim’s balloon, I decided to skip the artsy balloon pictures I normally take of the Dee III (I only have like 900 of them so far) and to focus on the kids that would inevitably show. It was very cool to see things through his eyes, even more so then I recognized in the past. Tim actively seeks out places to land where he will be able to get the most kids involved. 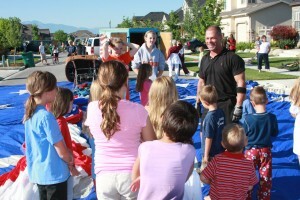 Sure the wind and balloon gods have something to do with where he lands, but when they aren’t in control the kids are. Several times I have seen him land in the street in neighborhoods and watched as dozens of kids come out of their houses in their pajamas, awoken by frantic parents alerting them of the hot air balloon that just landed outside. These kids come out groggy and sleepy eyed, and slowly you watch the transformation as they are invited in. They are in awe, they are excited, and when Tim is done with them they leave with an experience they will be telling their friends about for weeks, and a new love for hot air balloons. Tim may think that my family is stalking him, and to some extent we are. But we just love to see the man in action, and to watch a neighborhood light up by his presence. We feel honored to call him a friend, and are glad that he is someone that we can be happy that our son looks up to. Yea…Mr. Tim Dee-Taylor an Awesome Person! My Hero too! I remember him saying Just like in the Santa Clause…If he fell off the roof he would gladly take on the job! Not to mention we both share A Love for Disneyland…Living the Magic of Walt Disney. Inspiration has got us both through A lot! He showed up after my friend crashed his Ultra-lite Plane. His heart so Big and felt the pain for him. What an Amazing Friend! So Blessed to have him in my life! yup.got to love that guy.